﻿﻿﻿﻿﻿﻿﻿﻿A weekend Hill Country getaway features lakes, caverns and waterfalls. Only an hour’s drive from Austin, three state parks offer a variety of natural wonders for an enchanting and relaxing weekend away. Inks Lake State Park, Longhorn Cavern State Park and Pedernales Falls State Park were our hosts one weekend as my father and I did a little exploring, spending some quality time together while unwinding from our busy work schedules. Inks Lake State Park, located in the chain of Highland Lakes near Marble Falls, welcomed us on a Friday afternoon. After we traversed a roller coaster of hills, the lake appeared before us, glistening in the late afternoon sun. Surrounded by hills and granite outcrops, the park opened to the public in 1950. It covers more than 1,200 acres of recreational space and offers incredible hiking, fishing, boating and camping. Soon after arriving, we hit the trails and took a short hike along Spring Creek to the Devil’s Waterhole. Along the way, we saw a variety of bird species, including a family of cardinals, and rubbings from the white-tailed deer hiding in the brush. Underneath a canopy of trees, we reached the waterhole. 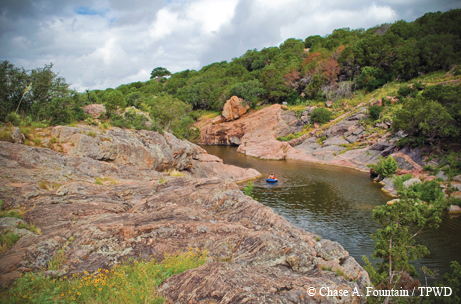 Located in a small portion of the lake that is almost completely enclosed by pink granite, the Devil’s Waterhole tempts daredevils to jump off the cliffs and swim. ﻿Inks Lake offers scenic views and swimming holes, such as Devil's Waterhole. After our hike, we visited the park store to buy bait and rent fishing poles and tackle for the weekend through the tackle loaner program that is offered in many state parks. We decided to take our chances with fishing from the shore for our first day, but after getting only a few nibbles, we knew that it just wasn’t our lucky day. Starving, we fired up the grill at our lakeside cabin. My dad, ever the grill master, whipped up two plates of steaks, potatoes and beans that were the cherry on top of a perfect day. The remainder of the evening was spent talking underneath a canopy of stars. Saturday morning, after waking up to the sounds of ducks on the lake, we headed out to Marble Falls for breakfast. Blue Bonnet Café, located on Main Street in the heart of the town, is owned by John and Belinda Kemper and has been in business since 1929. The café has gained a legendary reputation and is the recipient of numerous awards. Famous customers — President George W. Bush and first lady Laura Bush, Texas Gov. Rick Perry and first lady Anita Perry, Willie Nelson, Darrell Royal and Roger Staubach — have enjoyed the culinary pleasures there as well. When we walked in, the pies immediately caught our attention. The huge, meringue-topped creations made me want to abandon my diet. Instead (it was breakfast, after all) I ordered a Western omelet, and dad chose a stack of buttermilk pancakes that melted as soon as he put them in his mouth. Stuffed, we headed out to Longhorn Cavern State Park. 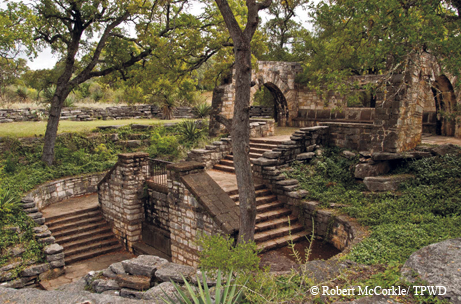 Located less than 10 miles from Inks Lake, the cave has a colorful history. In 1934, the Civilian Conservation Corps began hauling more than 2.5 tons of debris, silt and guano out of the cave. The limestone cavern was formed by an underground river (one of the few river-formed caverns in Texas) and stays at a constant temperature of 68 degrees year-round. Portions of the cave are covered in crystals that tricked some CCC workers into thinking they had found a diamond mine. ﻿﻿CCC work at Longhorn Cavern State Park. The cultural history of the cave is just as captivating as the crystal halls and marble-like ceilings. Comanche Indians, who used the largest room in the cave for tribal gatherings, were perhaps the cave’s first occupants. Today, that space is known as the Indian Council Room. During the Civil War, the cave was used as a stronghold for Confederate soldiers, who manufactured gunpowder there in secret. Legend holds that the cave also played host to Wild West outlaw Sam Bass; it’s rumored that he hid treasure in a portion of the cave before he was killed by the Texas Rangers. In the 1920s and early 1930s, the cave was used as a dance hall, nightclub and restaurant, equipped with a bandstand and a bar made from the cavern rock. You’ve never really experienced total darkness until you go underground. To show us how dark it really was down there, our guide instructed us to put our hands in front of our faces before she shut off the lights. Our hands disappeared, and I was terrified. I wiggled my fingers around an inch in front of my face and still did not see a thing. Then she flipped a switch, and we could see again. Our guide also explained that lights would automatically turn off behind us as we continued forward to protect the cave walls from damage. We ate lunch at the restaurant in the visitors center by the stone fireplace, perusing an array of photographs and yellowed newspaper clippings about the cave’s unique history. 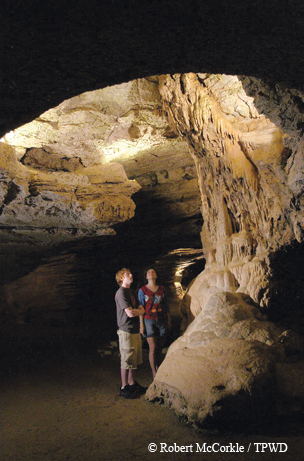 The cave offers several special tours, such as the Wild Cave Tour, which takes you through the nooks and crannies of the cave, and the Paranormal Tour, conducted once a month during the evening hours for those intrigued by the supernatural. A three-story rock observation tower offers a 360-degree view of the Hill Country, including Inks Lake and Falkenstein Castle, a private home built to resemble a medieval Bavarian castle. ﻿﻿﻿Longhorn Cavern was formed by an underground river. My father and I spent the remainder of the afternoon on the fishing pier at Inks Lake. After several close calls, we returned to our cabin empty-handed but relaxed and satisfied. The next morning, we checked out of our cabin, returned to the Blue Bonnet Café for another hearty breakfast and proceeded to Pedernales Falls State Park, the third leg of our trifecta. Located near Johnson City, Pedernales Falls State Park is home to nearly 20 miles of hiking and mountain biking trails, 10 miles of horseback riding trails and another 14 miles of trails open only to hikers and backpackers. More than 150 bird species have been spotted at the park, including roadrunners, bald eagles and the endangered golden-cheeked warbler, but the main attraction of the park is the falls, a series of tilted limestone formations that are 300 million years old. With no shortage of trails to choose from, we decide to take the quarter-mile trek to Twin Falls, a small waterfall not far from the campground. After a quick hike, we reached the falls and sat on the observation deck listening to the water cascade over the rocks and into the pool below. Afterward, we went to find the famed Pedernales Falls, located in the northern end of the park. At the scenic overview, we could see the large limestone slabs that create the falls as well as several pools of water and gravel beaches. We followed one of the trails adjacent to the overlook, climbing over the towering rocks for a closer view of the falls. After an adventurous (yet still relaxing) weekend, we knew that it was time to head home. We packed our hiking boots and headed back down U.S. Highway 281 toward looming deadlines at work. This weekend together helped us realize how important it is to stray from the everyday routine and take a minute to catch your breath. With so much more to discover at each location, we made plans to return soon to take in all these three parks have to offer. 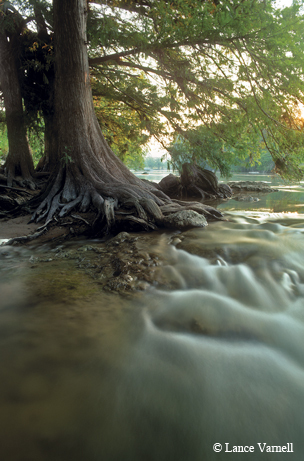 Bald cypress trees line the banks of the Pedernales River.